Googlers are known to work on Christmas Eve and Christmas Day, they have been doing so for as long as I can remember. I like to give kudos to some (not all) of the Googlers who spend the time to respond to webmaster and SEO questions on and during Christmas because they could easily be spending time with family and no one would complain. John Mueller, aka JohnMu, replied to about a dozen threads between the 23rd and 26th of December. From wishing happy holidays to IP address questions and robots.txt issues. JohnMu is known to often be around helping webmasters on Christmas and New Years. Matt Cutts made a rare appearance in the forums, he spends most of his time in other areas but came out on Christmas day to help webmasters. He posted in three different threads all on Christmas day. Yes, there were other Googlers responding to questions in the other forums but I wanted to point out those answering SEO and webmaster questions. Like I said, Googlers are known for working on the Christmas and New Years break. They did in 2010, New Years 2009 New Years 2008. Also Christmas 2009, 2008, 2007 and 2006. I won't be writing more stories here today - since it is a day off for most and the forums were pretty slow. 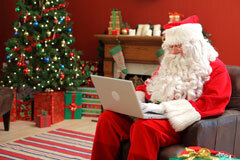 Image credit to ShutterStock for working Santa.